Thinking of Travelling the Baltics? Here’s a Sample Baltic Itinerary! If you want a Baltic travel itinerary, you are in the right place! 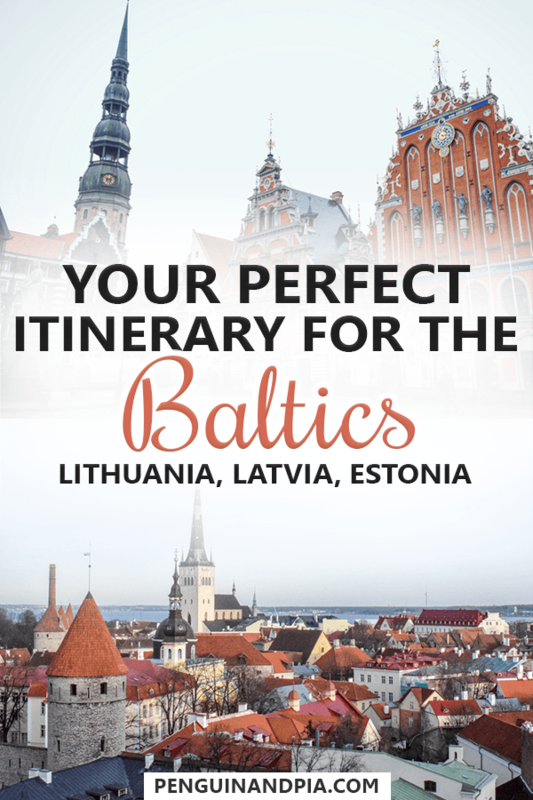 Planning a trip to the Baltics can be a challenge – even though they are so small, there is a ton to do and see in each of the Baltic States! This is the first post about the Baltics on Penguin and Pia so we are going to be adding lots more information on the region in the future! 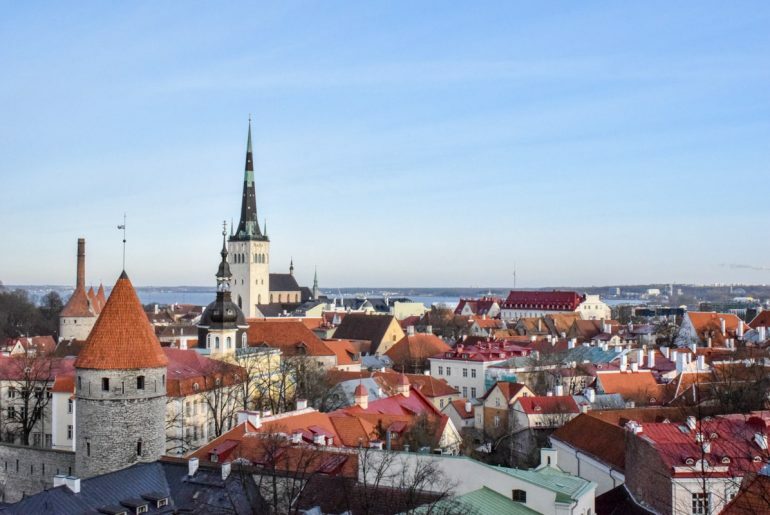 Our passion for the Baltics has a backstory: Eric did a mini trip through the capitals (and added on a few day trips) in 2017 after he and Lisa went on their first trip together wandering Europe. Now that he’s seen the Baltic countries, he’s eager to bring Lisa on an epic Baltic road trip! So, as a good place to start, below is a sample itinerary with the capitals, day trips, hostels, and other points of interest in the Baltic states. In fact, all of Eric’s hostels in all three countries made our massive list of European hostels we loved staying at! Before you dive into Baltic trip planning, you’ll want to consider a few details. From the currency they use (the Euro) to the weather, safety, and the best time to visit, we cover a few key areas below to help you prepare. The Baltics (not to be confused with the Balkans, another region we absolutely love) is a small grouping of countries that are bordering the Baltic Sea in the Northeast part of Europe. While a few of the countries that lie on the Baltic Sea can be considered Baltic countries, the Baltic States in their traditional definition are: Lithuania, Latvia, and Estonia. These three countries were part of the Soviet Union until their independence in 1991. Their capitals are beautiful, and are Vilnius, Riga, and Tallinn, in order of above! Realistically, the best time to visit the Baltic countries depends on the type of travel you like to do. It will also depend on the types of activities you want to. Eric visited in the winter and while it was much colder, there was still lots to do and explore. Another perk was that there were fewer people around. 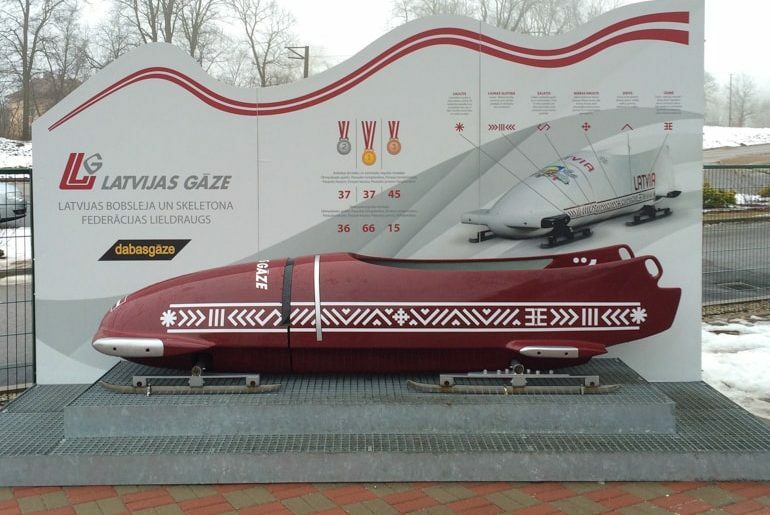 Also, he wouldn’t have been able to go bobsledding in Latvia (see below) if it was summertime! There’s a reason a few of the Baltic capitals made the list of our favourite cities in Europe to visit in the winter. Summertime means that the national parks in Estonia are full of hikers and wildlife. Summertime also means that the beaches along the Baltic Sea (like in Klaipėda, Lithuania) are going to be full of sun-seekers. Day trips to Trakai Castle in the summer mean beautiful lakes and water activities. The winter means walking on the lake and enjoying the cold but peaceful atmosphere. See – there is no easy answer! For the best of all worlds, consider visiting in the shoulder seasons of April-May and then September-October. The spring is cooler and there might be some rain but there will be fewer crowds and the snow will be gone. The fall can also be nice because up in Estonia especially you’ll get to see beautiful coloured leaves. Getting around the Baltics is pretty easy since there are only so many large centres and they are all connected via highways (usually). This makes planning a route a no-brainer if you just stick to where the highways bring you! We’ll get to car rentals below. As for Eric’s trip, he took the bus between all the Baltic capitals, ending in Estonia. It was awesome – we actually wrote a whole detailed post on taking the bus between the Baltic capitals from Vilnius to Riga to Tallinn. The bus company in the region is LUX Express. He even took it from Warsaw to Vilnius to start the Baltic portion of the trip. To be honest, after travelling with the big names like Megabus, FlixBus, ones in the Balkans like CroatiaBus, LUX was probably the cheapest and overall best experiences he has had with a bus company. The best part about LUX Express is that tickets can be cheap but still a quality experience. You can check the timetables and latest deals on the LUX Express website. If you are feeling like driving as opposed to the bus, renting a car is definitely a good option here in the Baltics. The thing is that these countries aren’t very big and so driving between places isn’t a huge time commitment like in other countries. Plus, having a car means that you can adventure off and day trip if you want to to see more than what you would be able to by sticking to a bus route. In the Baltics, the highways are pretty good – regional roads between cities are paved and well-maintained. With any country, the more rural you get, the worse the roads become but that’s sort of a standard you’d come to expect. Another big plus is that since the Baltics are all in the EU and the Schengen Zone, there are no internal borders between them. So you can drive wherever you like and cross borders without any problems! Given that Baltic road trips are very doable, there are loads of rental car agencies available. You can compare prices from different agencies for the duration of your trip with this handy tool. Make sure to read the fine print about additional costs in case there are any issues. Because so little is typically known about the region – this is a popular question to ask. With a rich history and an intimidating neighbour to the east (Russia), it’s no wonder we wonder if the Baltics are safe. In short, we think the answer is: yes, but. The Baltics themselves are politically stable and developed nations. They are in the EU – and that wouldn’t happen if the countries still needed to get their act together. With any country, however, it’s always wise to keep your guard up in an unfamiliar place. The capitals are beautiful and can get quite touristy in the summers. As a result, you’ll want to watch your pockets in crowded areas in the Old towns of Riga and Tallinn. If you decide to hike through a National Park, remember to lock your car and/or take valuables with you. A local connection (who took Eric for beers and dinner in Vilnius the first night he arrived) mentioned that you wouldn’t want to hang around the main train/bus station at night. That said, is there any train station you WANT to hang around at night in any country? Not really. So, use common sense or ask locals/hotels/tour providers about what’s a good area or not! When visiting the Baltic countries (or travelling in general) it’s usually a good idea to have travel insurance. This includes medical travel insurances and the coverage for things like lost baggage or delays. If you aren’t already covered by a company plan, extended medical plan, or a credit card insurance plan, we recommend that you get private travel insurance. Eric has used World Nomads multiple times for that in the past. Just be sure to read the policy before you buy to make sure you are eligible for coverage! You can check how much you’d pay to be covered for your Baltic trip here. Below you’ll find a map laid out in the order of the post. Notice that we head from south to north – from Lithuania up into Estonia. There are a few day trips along the way as well. This is helpful if you’ve never really taken a good look at the Baltic region before! They are basically stacked one on top of the other – making it easy to travel between them! If you plan on travelling the Baltics, we want to help you out with a sample Baltic itinerary. We’ve decided to write about it in the way that Eric did it – south to north. This means that you’d start in Vilnius, Lithuania and head through Latvia to Tallinn, Estonia. Just go for a wander around Vilnius – you’ll find some beautiful architecture. How to Get There: Bus from Warsaw, Poland is about 7 hours, could also fly into Vilnius. Beginning the itinerary with a great first city, Vilnius is a rich city full of history around every turn. Eric explored the city on his own for most of the days he was there. In that time, he explored the Hill of Three Crosses, Vilnius Cathedral, the Bell Tower among other attractions. If you wanted an actual guide (and not just wander as Eric did) then you can go on a Vilnius walking tour with a local guide. When Eric stayed there, he stayed in Jimmy Jumps House Hostel. It was a great stay – the people were awesome, the staff were friendly and welcoming, the location is right in the centre of the city, and they even make you waffles for breakfast! Accommodation for Vilnius: Check for hotel deals or Hostelworld for great hostels! Visiting Trakai in the wintertime was a neat experience. How to Get There: Bus from Vilnius, car would also be easy – takes about 40 minutes. 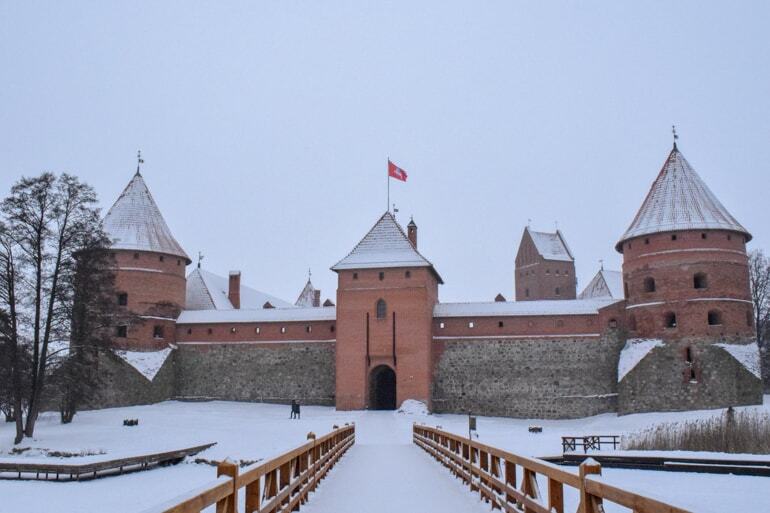 Whether it’s the summer or the winter, a day trip to Trakai (and to visit the Castle) is definitely worth your time. Eric went in the wintertime and even though it was super cold, it was really cool to basically have the castle to himself! The town itself is situated on the lake so it’s beautiful in the summertime as well. Trakai Castle was built in the 14th century and remains an important place for Lithuanians as a medieval stronghold and a symbolic place of where statehood is preserved. There are lots of different exhibits and galleries within the castle so it’s worth the admission fee. You can learn more about the town an the castle here. Nearby, the town is filled with small shops, cafes, and restaurants. These were open in the winter time and we can’t even imagine how busy (but lively) the town must be in the summer. If you wanted to leave the car in Vilnius, you could always take a day tour to Trakai to make the journey and guided tour super simple. If you planned on staying in Trakai in the summer, there are resorts and guest houses available! Accommodation for Trakai: Check for guesthouse and resort deals! How to Get There: Train, Bus, or Car – all methods take approximately 1 hour and 30 minutes from Vilnius. Eric really only drove through Kaunas but his local friend who met him for dinner was from there. He explained that Vilnius, as the capital, was better for history and charm, whereas Kaunas was more lively with things to do for the younger crowds. Obviously, there is a great deal of history in Kaunas with a castle, a monastery, cathedral, and many museums. There are generally lots of cafes, restaurants, and shops in Kaunas as well as venues for music, etc. To learn more about Kaunas, check out the tourism website! 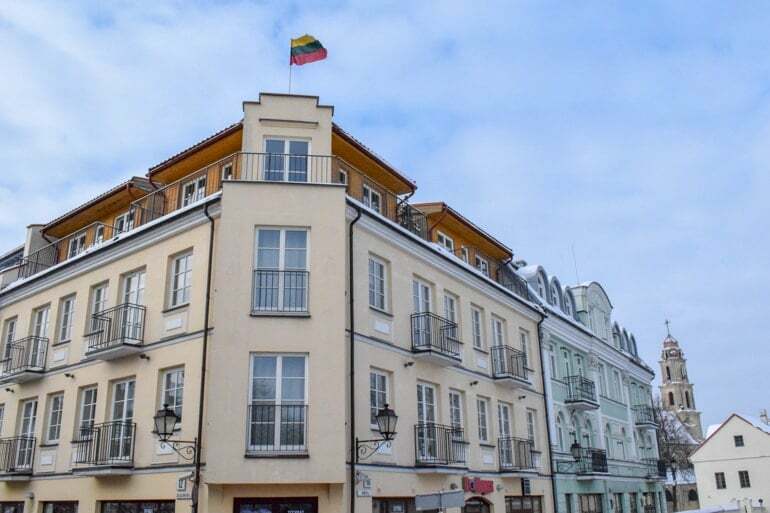 Accommodation for Kaunas: Check Booking.com for hotel deals or Hostelworld for great hostels! Heading out to the coast of the Baltic, you’ll find the port city of Klaipėda. Klaipėda is a historic city with seafaring roots that go back centuries. The old wooden, German-style buildings along the ports serve as a charming backdrop for cruisers that arrive into the busy port. Klaipėda is actually Lithuania’s third largest city – and so there are lots of things to do from museums to restaurants, theatres and green space. The National Park – Curonian Spit – is a massive sand dune located close to the city. You can learn more about visiting Klaipėda here. Accommodation for Klaipėda: Check for seaside hotel deals or Hostelworld for great hostels! As the fourth largest city in Lithuania, you might think there’s nothing left to see! That’s where Šiauliai proves you wrong. While you’ll find many old museums in the city, the city is also a place of pilgrimage and served as a place of resistance to Soviet rule. As a result, you’ll find the Hill of Crosses nearby to the city. On the Hill, there are over 100,000 wooden crosses that have been left there over the decades. It really is a sight to see and a place to be respected. If you wanted to see the Hill of Crosses for yourself but weren’t planning on heading to Šiauliai on the way to Riga, consider a day trip from Vilnius for a Hill of Crosses Tour. Accommodation for Šiauliai: Check Booking.com for hotel deals! The Riga Town Hall in Town Hall Square is gorgeous and definitely photo worthy. How to Get There: Car from Šiauliai is just under 2 hours, Train from Šiauliai is just over 2 hours. As the largest of the Baltic capitals, there is TONS to do in Riga! Eric loved the city when we did his trip – and he wants to bring Lisa there someday soon so she can experience it, too! Riga is a fantastic mix of history with new-age shops, coffee places, restaurants, and style. You get hints of former Soviet rule mixed with progressive ideas from the young people. Not to mention it has incredible buildings, cathedrals, monuments, and other must-see attractions (like the Space Monkey statue). Given the amount of history to Riga (much of it being significant Soviet history) a walking tour with an emphasis on Soviet tales might be for you! Besides that, there is lots of great food in Riga. Eric tried the local cuisine of deep fried bread at the traditional restaurant and beer hall. Now, if you are thinking “hmm, that would be delicious and definitely not healthy for you”… you’d be absolutely correct. If you wanted to try other authentic cuisines, consider a food tour around Riga with a local guide who knows their stuff! We plan on writing up a whole other post on Riga soon so you’ll get lots more tips there. As for a place to stay Eric stayed at Naughty Squirrel Backpackers. Technically a party hostel, it wasn’t as crazy as it sounds. The staff were great, the people were nice, and the place was huge. You could lounge around or choose to socialise if you wanted. Bunks and rooms were huge and had amenities in the bunk which is always a nice detail. Eric would definitely stay again for the tiny bar on hand and the free welcome shot of Latvian liqueur – Black Balsam! Accommodation for Riga: Check for great Riga hotel deals or Hostelworld for great hostels! This is similar to what Eric rode in down the track – a real bobsleigh! How to Get There: Just under an hour driving, just over an hour with the Train. Sigulda makes a great day trip or a longer escape from the city. Known for dense forests, castles, and parks, the city has one other attraction that is well-known around the world. Sigulda is home to one of the world’s few operational bobsled tracks that are open to visitors – and you can ride a real bobsled down it! Eric paid for the experience to be driven by a member of the Latvian sliding team – and WOW is it worth it! The town itself is charming but the draw for people is the number of things to do that will excite you and keep you busy. You can learn more about Sigulda here. Accommodation for Sigulda: Check Booking.com for hotel deals! If you’re done with Riga and want to check out more along the Gulf of Riga, then head to Jūrmala. This beach town is a resort city that lies just west of the capital making it a great day trip. The city is known for its massive sandy beach that gets busy in the summers as people head there to cool off and hang out by the water. The shore is lined with seaside villas and other shops made from wood seeming like they were plucked from another era! There are also a few parks and wooded areas which are great for small walks and hikes. Learn more about visiting Jūrmala here. Accommodation for Jūrmala: Check Booking.com for hotel deals! If you want to enjoy the Estonian version of Jūrmala, then head to Pärnu. Known for its Estonian sunshine and sandy beach, Pärnu Beach is a resort town with youthful vibes, cool art, and historical bathhouses scattered through the city. Pärnu is actually the fourth largest city in Estonia but the population balloons in the summertime with tourists and locals coming out to enjoy the water in Pärnu Bay. From restaurants to nightlife there’s something for everyone. Check out more to do in Pärnu here. Nearby, the Soomaa Wetlands are located in Soomaa National Park. The park itself is known for its high water. This makes the area great for canoeing and sighting wildlife. Accommodation for Pärnu: Check Booking.com for hotel deals! The views from above the Old Town are amazing in all directions! Oh, Tallinn. Such a beautiful city. Eric was lucky enough to be guided around Tallinn by his former flatmate from when he lived in Edinburgh. Needless to say, having a local around was a great way to experience the city! We plan to write a whole post on things to do in Tallinn – but for now, you get this sampler. Tallinn is known for its Old Town. So, you should start off with a wander there. The bright rooftops and cobblestone alleyways transport you back into medieval times. There is quite a bit of history and amazing restaurants, cafes, and churches in the area. We walked around with our local guide but you could hop on a bike and take a guided tour – might be lots faster and you’ll get some exercise! If you are done with attractions in the city centre, you should visit the Tallinn Tv Tower which is located just a quick bus ride away. As the tallest building in Northern Europe, it’s a pretty great attraction that is worth the view for the price of admission! Eric visited with his friend and even though the views were a little cloudy it was still amazing to see the countryside and the Baltic Sea! If you know you want to go in the high season – get a line skip ticket for the Tallinn Tv Tower. As for sleeping, Eric stayed at Red Emperor Bar and Hostel. For the price and the location, the hostel was good. There was a bar onsite (never got too crazy, just very social) with a lounge for loud and another one for quiet. The rooms were standard – good lockers, good bunks, good bathroom facilities. The staff was very chill and you even get a beer with check-in! The location is just outside the Old Town so like we said – it’s a good place to crash for a few nights and meet interesting people. Accommodation for Tallinn: Check Booking.com for hotel deals or Hostelworld for great hostels! With a landscape and wildlife similar to Canada (they are at similar latitudes to parts of Northern Canada), Lahemaa National Park is a nature lover’s dream. Lahemaa is just a short distance from Tallinn yet it’s such an important forested area for conservation in Northern Europe that includes hiking to rock cliffs, waterfalls, beaches, and even moose! If you want to learn more about Lahemaa, you can check out the official website. To make the trip even more simple, you could make the day trip a day tour to Lahemaa from Tallinn with a guide. How to Get There: Ferry from Tallinn is 3 hours. Flying takes 30 minutes (Eric did it by accident – it’s a long story). Ah yes, a Helsinki day trip from Tallinn. Taking the ferry to Finland is a great option if you’ve got a day to kill and you’ve seen everything in Tallinn and the surrounding area. That said, we wrote a whole post on how to take the ferry from Tallinn to Helsinki (and back) so check that out if you are interested! Once you get to Helsinki, there is loads to do and see. Eric only had a few hours to explore the city but really wants to return with Lisa since she’s never been. 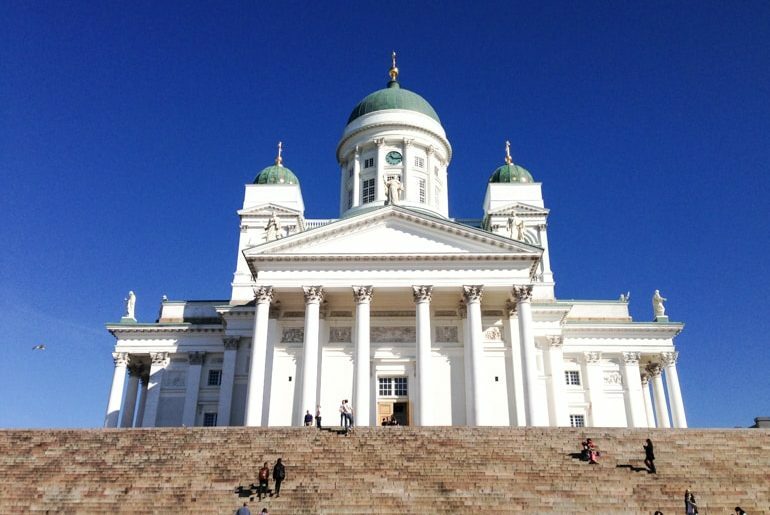 If you want to know what to check out in Helsinki, read the guide written by our local connection Nick about the perfect day in Helsinki! That said, if you DID want to sleep there, check below for great places to stay in Helsinki. Accommodation for Helsinki: Check Booking.com for hotel deals or Hostelworld for great hostels! And there you have it – a few great ideas and a rough itinerary around the Baltics. In the end, there is so much to check out in these tiny countries that you’ll end up coming back for another trip or two. This post was just to get you acquainted with the countries and the idea of travelling the Baltics! What do you think? Have you been to the Baltics or are you considering it? We can’t wait to get back there because Eric wants to show Lisa around! We’ll keep ya posted!